The EUR/USD has been the model of volatility since the breakout occurring on July 8th. 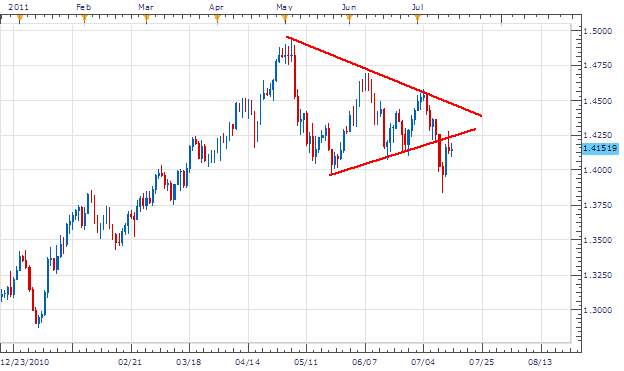 This breakout ended the large consolidating triangle that has been forming since our May 8th high at 1.4938. Even though price has traded as much as 1100 pips lower, price is retracing back to previous support (now resistance at 1.4250. This will give traders chances to join the next wave of the breakout during the present pullback. Fundamentally, both the Euro and the US Dollar both have their issues. The Euro however leads the pack in regards to bad news with its debt crisis now looking to extend into Italy. Today’s Banking Stress Test, See Economic Calendar , may be the catalyst for a further decline and a resumption of our newly formed trend. Moving to a 4H chart, we can clearly see the backside attack on our longer term resistance level at 1.4250. 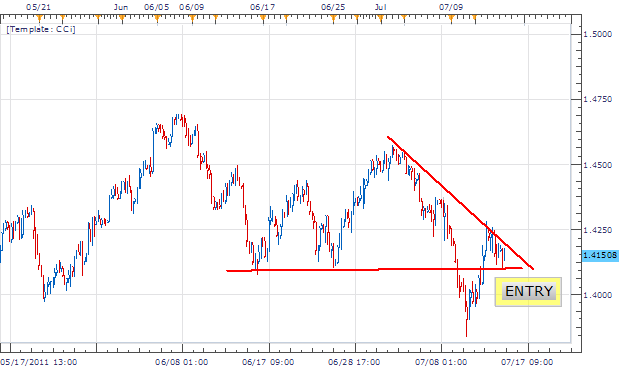 This level, 1.4250, also formed resistance on a descending triangle created by aligning with the July 3rd high at 1.4529. As we watch a bounce off of resistance, sellers can look to current support near the 1.4100 for our next breakout signaling a resumption of our trend. My preference is to sell the EUR/USD under June 16th low placing entry’s near 1.4070. Stops should be placed above support over 1.4250 risking 180 pips on the position. Limits should be set at a minimum profit of 360 pips at 1.3710 or better. Alternative scenarios include price breaking above current resistance, retesting the 1.4250 handle. Walker England contributes to the Instructor Trading Tips articles.